We love the Maldives. To prove it, this will be our fourth liveaboard charter in the Maldives since 2014. However, this trip will be different. How so? Well, to start, we spent six months interviewing numerous potential yachts for this unparalleled charter. 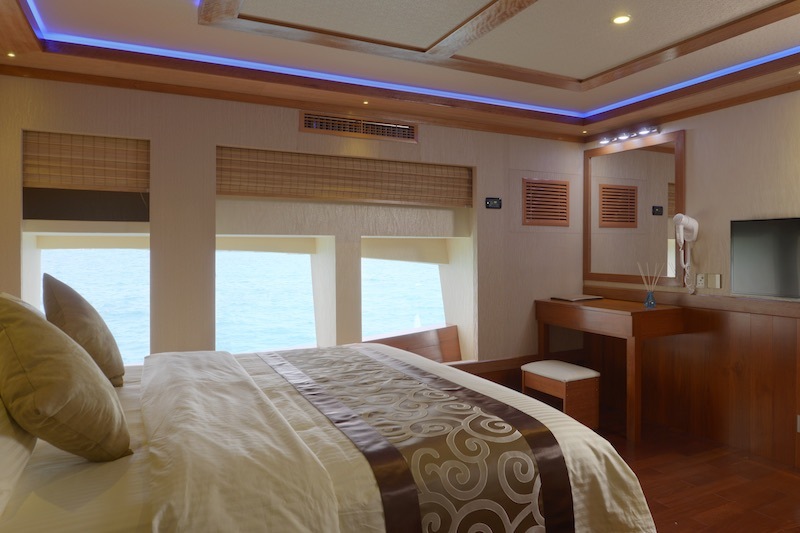 See, most liveaboards in the Maldives only do one week charters. As you can imagine, one week (or six days of diving) isn't nearly enough time if you are going to travel all that way. The solution: select one of the top liveaboards in the Maldives and charter it for THREE WEEKS STRAIGHT! Yep. Twenty one days in a row which have been divided into two separate trips with special routes and itineraries, April 20-May 1 (11 nights) and May 1-11 (10 nights). The result: we secured a super sick yacht, created two custom length dive trips, and are able to provide huge value to our guests. The phrase "bucket list" was created for trips like this. The Maldives is located at the equator in the Indian Ocean. It is approximately 300 miles southwest of India. The Maldives are comprised of more than 99% sea and less than 1% of land. The country is made up of 26 natural ring-like atolls. Each atoll is made of a coral reef encircling a lagoon, with deep channels dividing the reef ring. A string of islands take their places among this atoll ring; each island has its own reef encircling the island lagoon. The reefs of the islands, alive with countless types of underwater creatures and vibrant corals, protect the islands from wind and wave action of the surrounding vast oceans. Because they straddle the equator, the Maldives are obviously tropical, with temperatures around 75-91°F year round. Maldives has two distinct seasons: dry season (northeast monsoon) and wet season (southwest monsoon). The dry season extends from January to April/May. The wet season is from May/June to November. We are going at the end of the dry season. The Blue Force One was awarded the Best Built Liveaboard in 2014 by the Liveaboard Association of Maldives. This stunning luxury yacht is in a class of its own. Its beautiful design and special attention to detail ensures quality and luxurious comfort for all of our guests. The Blue Force One is designed to meet and exceed the high expectation of even the weathered traveler or anyone coming to Maldives looking for a journey of a lifetime on an exclusive yacht. This unique 139' long wooden vessel boasts eleven cabins and can accommodate up to 22 guests. 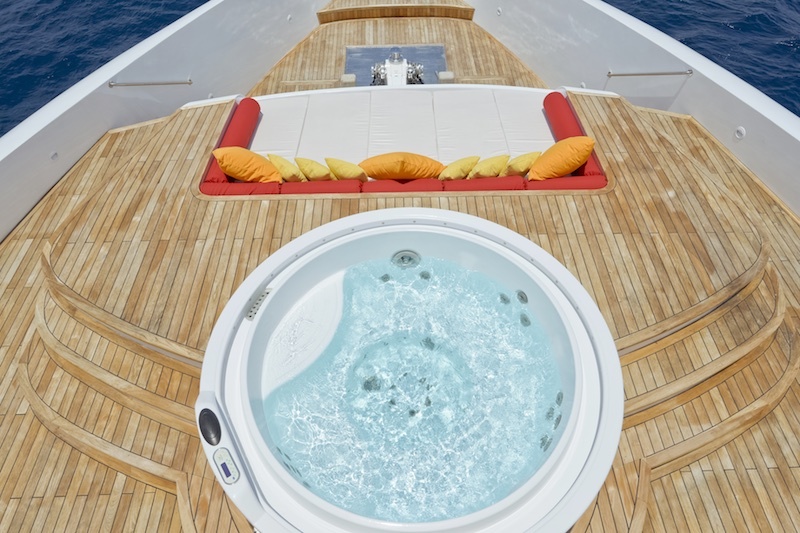 With sleeping accommodations on three different decks, the yacht is incredibly spacious. Choose from a Master Suite, Junior Suite, Master Cabin or a Deluxe Cabin. Each suite and cabin has individually controlled AC and en-suite bathrooms. There is no shortage of relaxation space aboard the Blue Force One as guests can choose from one of two Jacuzzis, three sun decks, upper deck bar, living room with huge armchairs and 65 inch TV and even a disco room! Guests are also welcome to take out stand-up-paddleboards, surf boards and kayaks in their free time. As if the 139' mothership wasn't enough, the Blue Force One has a dedicated 60' diving Dhoni (a multi-purpose motorboat). All diving is conducted aboard the Dhoni which houses the compressors and dive gear. This ensures peace and quiet on-board the Blue Force One. ACCOMMODATIONS: Total 11 cabins. 2 Master Suites, 1 Junior Suite, 1 Master Cabin, 7 Deluxe Cabins. Double and/or Twin beds. All suites/cabins have individually controlled air-conditioning with gorgeous interiors and trendy fittings, en-suite bathrooms with fresh hot and cold waters, hair dryer, remote control for lights, 32’ TV with in house movies, satellite, WI-FI, in boat phone circuit, safe, bathrobes and towels. FACILITIES: Two Jacuzzis outside one in the bow and the other in the stern. 3 solariums with sunbeds and mattresses (in the bow, stern and the upper bridge). Bar on the upper deck. Living room with sofas, massage armchairs, 65" TV with in house channels, satellite navigation and film system. Music equipment including Disco room with Karaoke. Daily housekeeping. Onboard kayaks. Audio & video entertainment. Library. Photography Station. Outdoor Dining. Separate rinse for u/w camera. Camera room with table and charging point. Full bathroom, hair dryer, remote control for lights and air-conditioning, 32’ TV with in house movies, satellite, WI-FI, in boat phone circuit, safe, bathrobes and towels. The Maldives is one of the world’s richest coral reef areas. 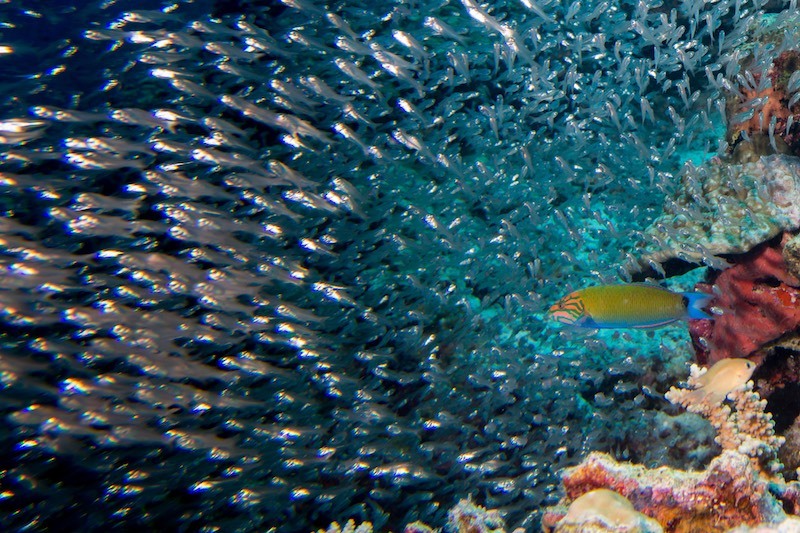 Over a thousand species of fish and other underwater creatures inhabit the Maldivian waters. The monsoon tides of the Indian Ocean create a collection of small marine creatures as well as microscopic plant cells. This in turn creates a hub for all kinds of underwater species who gather in these waters lured by the abundance of food. In the Maldives you will get to see everything. Dives in the Maldives usually take place along a faru (reef), a thila or giri, on a kandu (channel) a deep chasm where the atoll meets the ocean, or on a wreck. Thila and giri are Dhivehi words for pinnacle, a reef rising up from the floor of the atoll between 120 feet at the bottom up to between 3 feet at the top. If the top of the pinnacle is deeper than 12 feet, it is called a thila. If it’s shallower, then it is known as a giri. Diving is all conducted via a Dhoni that travels alongside the mothership. VISIBILITY: Ranges from 65 feet to well beyond – most of the time it is very, very good. Keep in mind that if you do get soupy visibility, it's usually a good thing. There aren't any rivers to muddy the water, so it's usually plankton clouding the water, which can bring in the whale sharks. DIVE SEASON: The diving is good all year long, but the southwest monsoon brings some rain between April and October, especially June to August. FEATURED CREATURES: You’ll find just about everything here, from the tiniest macro life to pelagics. 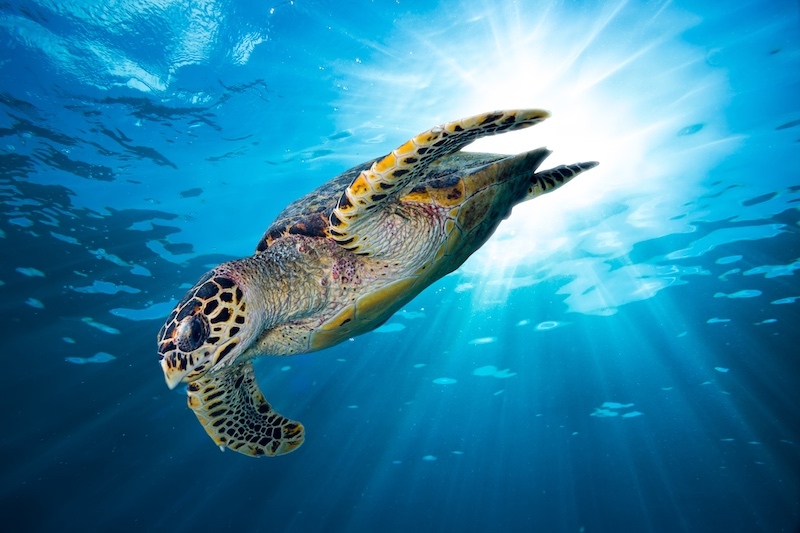 The Maldives is known for its long list of thrilling big animal sightings: manta rays, eagle rays, reef sharks, moray eels, even hammerhead sharks. Chances are good you will encounter the world’s largest fish: the whale shark. Whale sharks have been a protected species since the 1990s. Note: The dive sites below are just an example of the route taken and are not guaranteed. All dives sites are subject to weather conditions and local seasonal knowledge and the final route taken is at the absolute discretion of the captain and dive guides. Rasdhoo Madivaru Corner is located in the corner of the channel into the atoll. Madivaru has its fame amongst seasoned divers of the Maldives. It has one of the most spectacular reef formations found in Ari Atoll. Hammerhead sharks emerge in big numbers just before sunrise swimming in large groups. Dolphins, dog tooth tunas along with schools of black snapper are seen at the reef edge during the early hours. 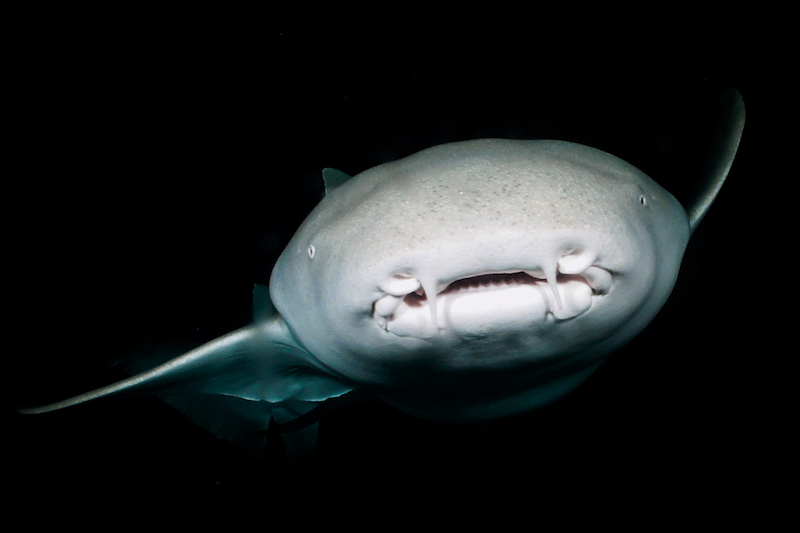 Divers get an opportunity to view white tip reef sharks, pelagics, trevallys, little tunas, jacks, ribbon eels, fish leaves tunas, napoleon wrasse and barracudas. Experience the thrilling scuba diving adventure amongst fine coral formations with highest underwater visibility. Since the eastern side of the channel is open ocean, large predatory fish can regularly be spotted here. This site is famous for sightings of sharks, schools of eagle rays and the occasional sail fish. The best condition to do the dive is when the current is flowing into the atoll. The dive begins on the outer reef following the current into the atoll. Most of the pelagic species can be observed on the eastern side, where the reef drops off into the deep ocean. At the end of the dive in the channel, along the reef you can find overhangs with plenty of soft coral growth and small fish. Fish Head also known as Shark Point or Mushimasmingili Thila, fits the classic definition of a thila – a large isolated flat top reef rising sharply from the inner atoll floor at 40 to 50m to around 10m from the surface. It is one of the best sites for seeing sharks. Featuring a series of caves and overhangs in between where you can see thousands of blueline snapper against a backdrop of black coral bushes and large gorgonians. Considered by many as one of the best dive sites in the Maldives, the atoll offers pristine reefs on the eastern side and thrilling shark dives – look out for hammerheads and grey reef sharks. A more challenging dive site which is not really advised for novice divers. Reef hooks recommended. The north east is peppered with submerged pinnacles covered predominantly in soft corals, while the west will see you surrounded by jacks and snappers. Keep an eye open for sharks and rays at 30m!